Model:QB0579 ALDEN SATCHEL Description: Recyclable 80gsm non woven PP small shoulder bag with Velcro fastening and gusset. 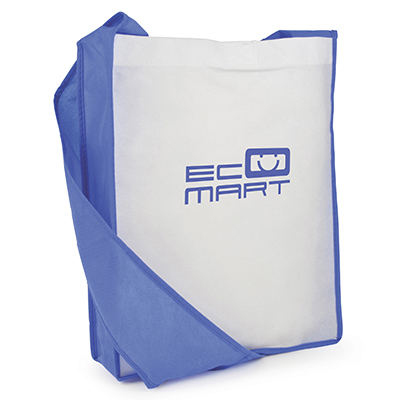 Colour Options: Red,Blue,White Product Data Specification Product Size 360 x 300 x 85 mm Product Weight Ink Colours If Applicable N/A Additional Information Price includes 1 colour print to 1 position only. Price excludes Carriage & Origination. Lead Times 5 working days from artwork approval. For Priority Service Lead times and pricing info please visit Priority-Service for more information. Personalisation Data Max Personalisation Pad/Screen Print Area 225 x 225 mm Engraving Area N/A Full Colour Area 225 x 195 mm Embroided Area N/A Max Spot Colours 6,CMYK Foil Block Embossing N/A Notes Prices inclusive of single colour print to 1 position unless stated. Set up and carriage are additional. 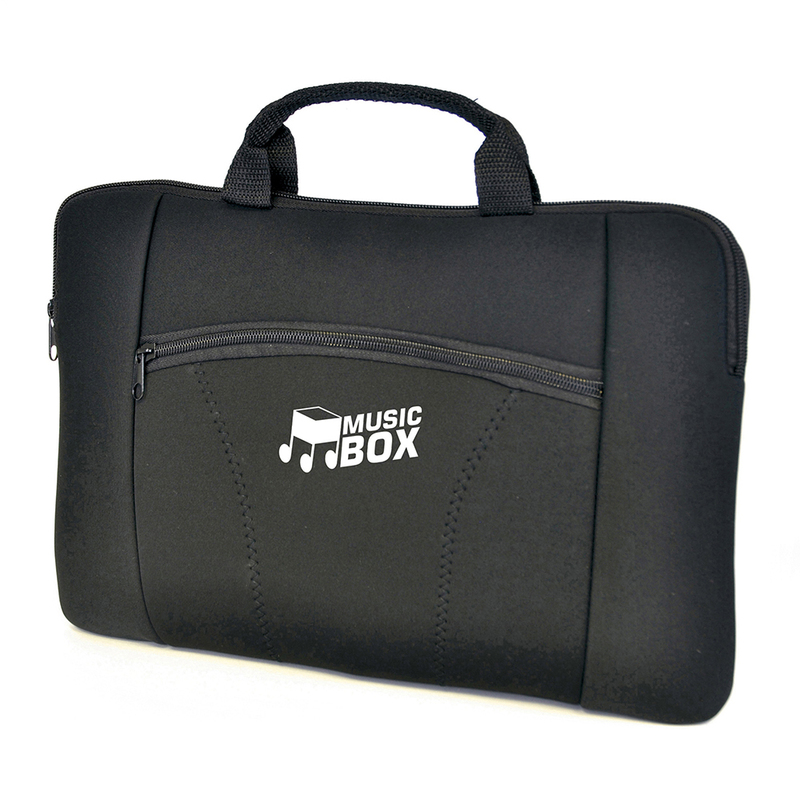 Model:QB0501 CANVAS FILE HOLDER Description: 10oz cotton canvas file holder with zip closure on the front and short carry handles. Available in natural. Colour Options: Natural Product Data Specification Product Size 400 x 300 mm Product Weight Ink Colours If Applicable Additional Information Price includes 1 colour print to 1 position only. Price excludes Carriage & Origination. Lead Times 5 working days from artwork approval. Personalisation Data Max Personalisation Pad/Screen Print Area 250 x 120 mm Engraving Area Full Colour Area 150 x 275 mm Embroided Area N/A Max Spot Colours 4,CMYK Foil Block Embossing N/A Notes Price includes a 1 colour print to 1 position. Set up and carriage are additional. 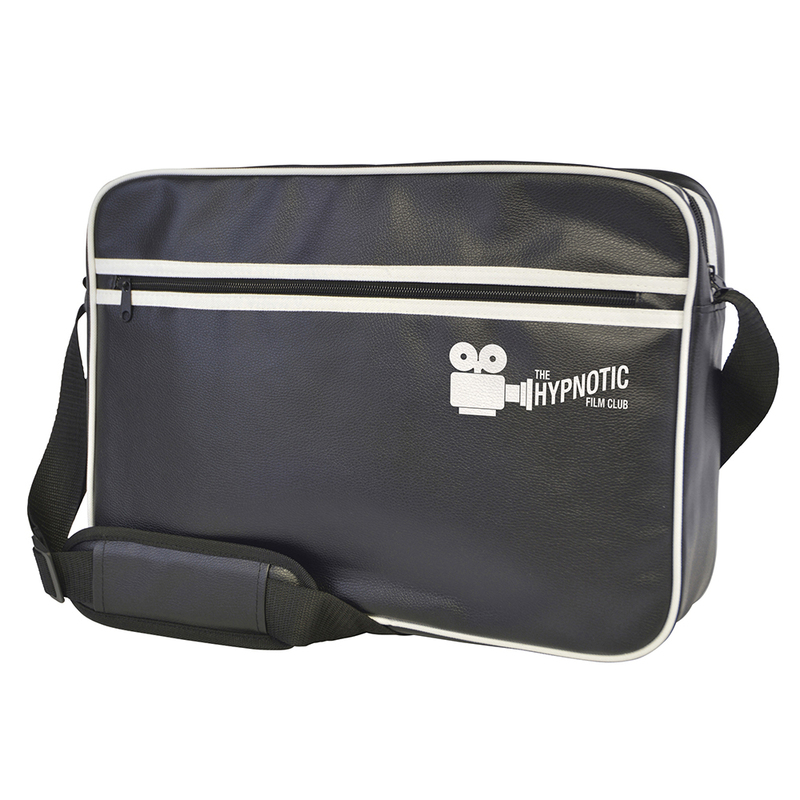 Model:QB0589 CONTRAST MESSENGER BAG Description: Recyclable 80gsm non woven PP messenger bag with coloured strap, gusset, base and edge trim and Velcro close. Colour Options: Amber,Black,Blue,Green,Pink,Purple,Red,Yellow Product Data Specification Product Size 356 x 300 x 93 mm Product Weight Ink Colours If Applicable N/A Additional Information Price includes 1 colour print to 1 position only. Price excludes Carriage & Origination. Lead Times 5 working days from artwork approval. For Priority Service Lead times and pricing info please visit Priority-Service for more information. Personalisation Data Max Personalisation Pad/Screen Print Area 225 x 225 mm Engraving Area N/A Full Colour Area 225 x 195 mm Embroided Area N/A Max Spot Colours 8,CMYK Foil Block Embossing N/A Notes Prices inclusive of single colour print to 1 position unless stated. Set up and carriage are additional. 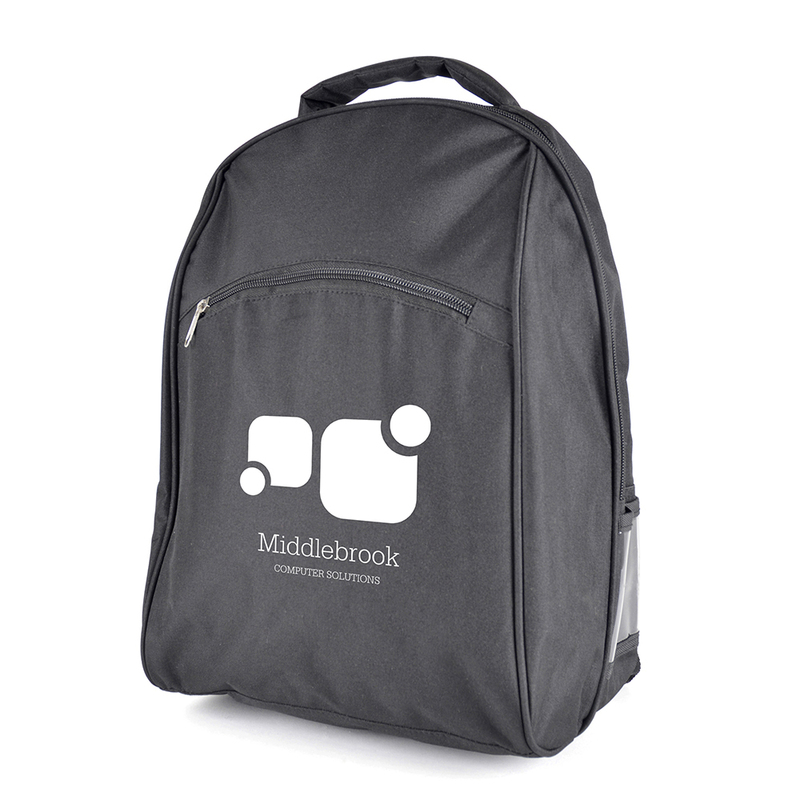 Model:QB0138 DEREHAM RUCKSACK Description: 600D polyester rucksack with padded laptop compartment. 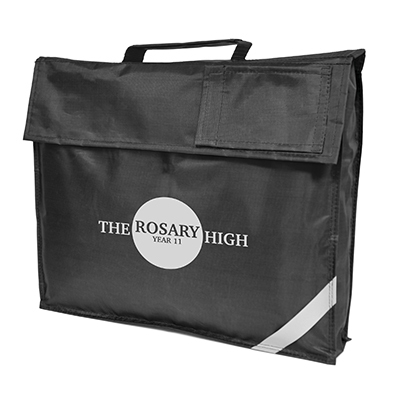 Includes large main zipped pocket, small front pocket with pen holder, clear pocket to the side and padded backing, shoulder straps and carry handles. Colour Options: Black Product Data Specification Product Size 410 x 300 x 150 mm Product Weight Ink Colours If Applicable N/A Additional Information Price includes 1 colour print to 1 position only. Price excludes Carriage & Origination. Lead Times 5 working days from artwork approval. Personalisation Data Max Personalisation Pad/Screen Print Area 120 x 120 mm Engraving Area N/A Full Colour Area 100 x 100 mm Embroided Area N/A Max Spot Colours 4,CMYK Foil Block Embossing N/A Notes Prices inclusive of single colour print to 1 position unless stated. Set up and carriage are additional. Model:QB0558 DUNNINGTON LAPTOP SATCHEL Description: 600D polyester laptop bag with adjustable strap and buckle clasp. With laptop space. 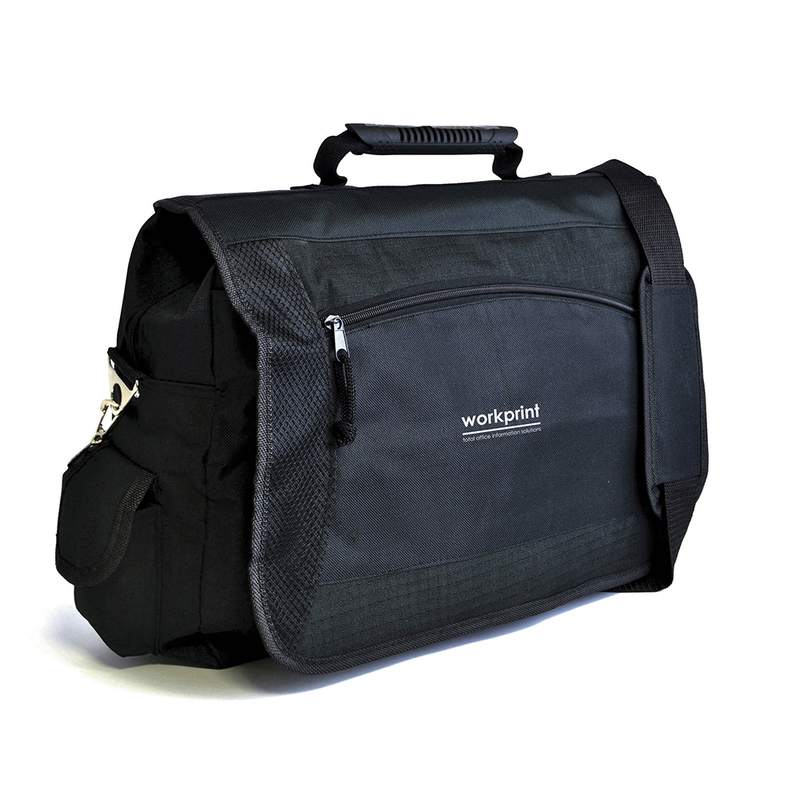 2 document holders, 2 mesh pockets, 2 smaller Velcro sections, 3 zipped pockets and 3 pen compartments. Colour Options: Black Product Data Specification Product Size 420 x 340 x 110 mm Product Weight Ink Colours If Applicable N/A Additional Information Price includes 1 colour print to 1 position only. Price excludes Carriage & Origination. Lead Times 5 working days from artwork approval. For Priority Service Lead times and pricing info please visit Priority-Service for more information. Personalisation Data Max Personalisation Pad/Screen Print Area 120 x 100 mm Engraving Area N/A Full Colour Area 120 x 100 mm Embroided Area Yes Max Spot Colours 4,CMYK Foil Block Embossing N/A Notes Prices inclusive of single colour print to 1 position unless stated. Set up and carriage are additional. 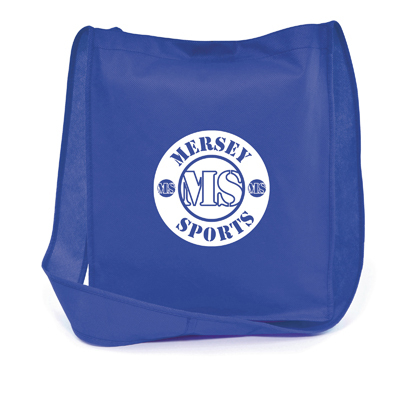 Model:QB0607 HUTTON CONFERENCE BAG Description: 600D polyester document bag with coloured trim. 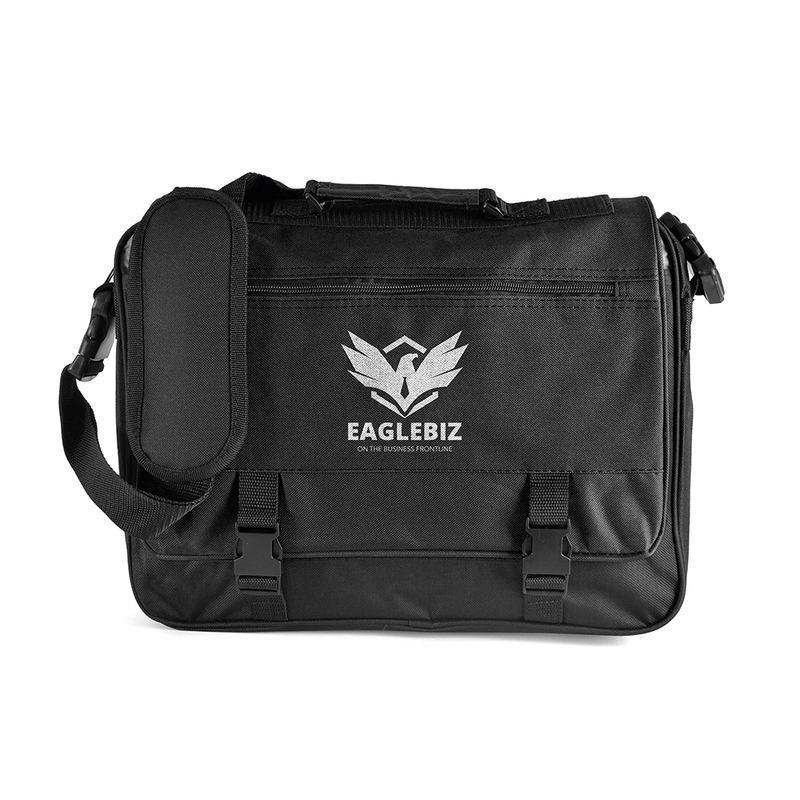 Includes pen and phone pockets, carry handle and shoulder strap Colour Options: Black,Blue,Red Product Data Specification Product Size 365 x 280 x 50 mm Product Weight Ink Colours If Applicable N/A Additional Information Price includes 1 colour print to 1 position only. Price excludes Carriage & Origination. Lead Times 5 working days from artwork approval. For Priority Service Lead times and pricing info please visit Priority-Service for more information. Personalisation Data Max Personalisation Pad/Screen Print Area 225 x 100 mm Engraving Area N/A Full Colour Area 225 x 100 mm Embroided Area Yes Max Spot Colours 6,CMYK Foil Block Embossing N/A Notes Prices inclusive of single colour print to 1 position unless stated. Set up and carriage are additional. Model:QB4001 JASMINE SCHOOL BAG Description: 420D polyester school bag with reflective strip and main Velcro close compartment with 2 small black flap pouches. Velcro flap on front of bag reveals a plastic window. 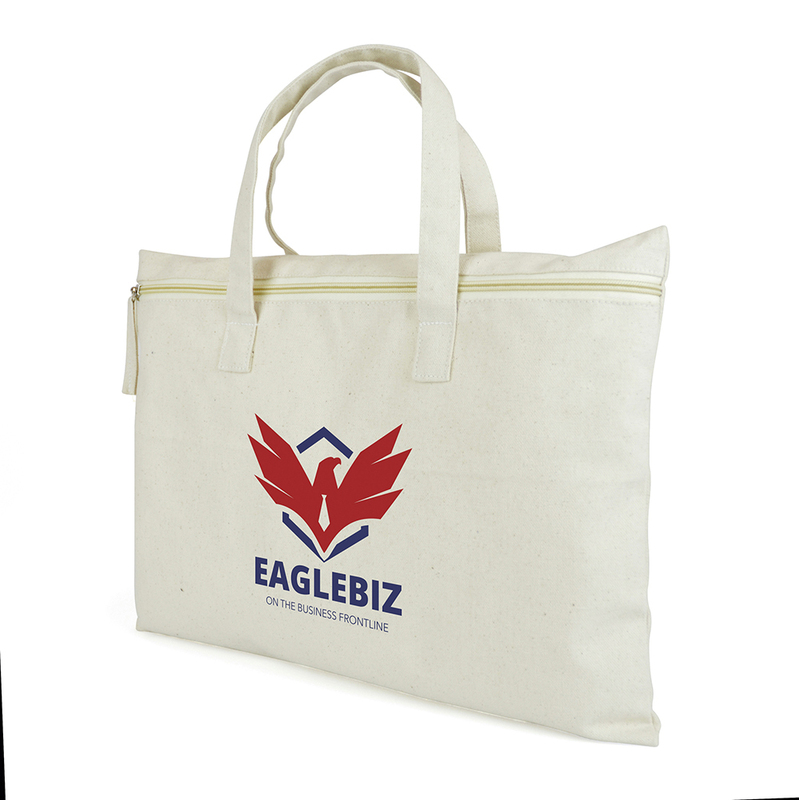 Colour Options: Black,Blue,Burgundy,Green,Purple,Red,Navy Blue Product Data Specification Product Size 370 x 300 x 55 mm Product Weight Ink Colours If Applicable N/A Additional Information Price includes 1 colour print to 1 position only. Price excludes Carriage & Origination. Lead Times 5 working days from artwork approval. For Priority Service Lead times and pricing info please visit Priority-Service for more information. Personalisation Data Max Personalisation Pad/Screen Print Area 225 x 120 mm Engraving Area N/A Full Colour Area 225 x 120 mm Embroided Area N/A Max Spot Colours 4,CMYK Foil Block Embossing N/A Notes Prices inclusive of single colour print to 1 position unless stated. Set up and carriage are additional. Model:QB0104 LUPUS LAPTOP SLEEVE Description: Deluxe neoprene laptop sleeve with handles to fit 15" widescreen laptop. Includes front zipped pocket. Colour Options: Black Product Data Specification Product Size 380 x 260 x 15 mm Product Weight Ink Colours If Applicable N/A Additional Information Price includes 1 colour print to 1 position only. Price excludes Carriage & Origination. Lead Times 5 working days from artwork approval. For Priority Service Lead times and pricing info please visit Priority-Service for more information. Personalisation Data Max Personalisation Pad/Screen Print Area 80 x 60 mm Engraving Area N/A Full Colour Area 80 x 60 mm Embroided Area N/A Max Spot Colours 1,cMYK Foil Block Embossing N/A Notes Prices inclusive of single colour print to 1 position unless stated. Set up and carriage are additional. Model:QB0606 NELSON SATCHEL Description: 600 D laptop satchel bag with coloured front flap with zipped pocket, carry handle and shoulder strap. 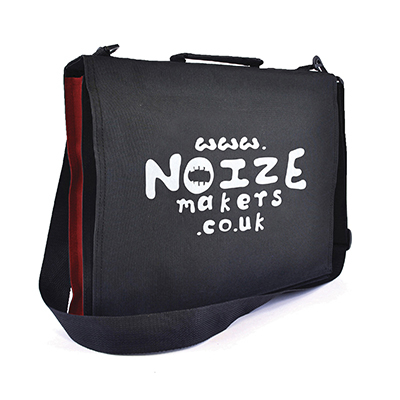 One large main zipped compartment, additional pockets, stationary organiser and dog clip. The bag seals with two plastic buckles. Colour Options: Black,Purple Product Data Specification Product Size 400 x 340 x 60 mm Product Weight Ink Colours If Applicable N/A Additional Information Price includes 1 colour print to 1 position only. Price excludes Carriage & Origination. Lead Times 5 working days from artwork approval. Personalisation Data Max Personalisation Pad/Screen Print Area 300 x 200 mm Engraving Area N/A Full Colour Area 200 x 60 mm Embroided Area N/A Max Spot Colours 4, CMYK Foil Block Embossing N/A Notes Prices inclusive of single colour print to 1 position unless stated. Set up and carriage are additional. Model:QB1020 RETRO LAPTOP BAG Description: PU retro style zipped laptop bag with padded laptop compartment and Velcro tab close. With zipped front pocket and adjustable, padded shoulder strap. Bag finished with front and back white trim and horizontal stripes. Colour Options: Black Product Data Specification Product Size 410 x 300 x 100 mm Product Weight Ink Colours If Applicable N/A Additional Information Price includes 1 colour print to 1 position only. Price excludes Carriage & Origination. Lead Times 5 working days from artwork approval. For Priority Service Lead times and pricing info please visit Priority-Service for more information. Personalisation Data Max Personalisation Pad/Screen Print Area 225 x 100 mm Engraving Area N/A Full Colour Area N/A Embroided Area N/A Max Spot Colours 4 Foil Block Embossing N/A Notes Prices inclusive of single colour print to 1 position unless stated. Set up and carriage are additional.